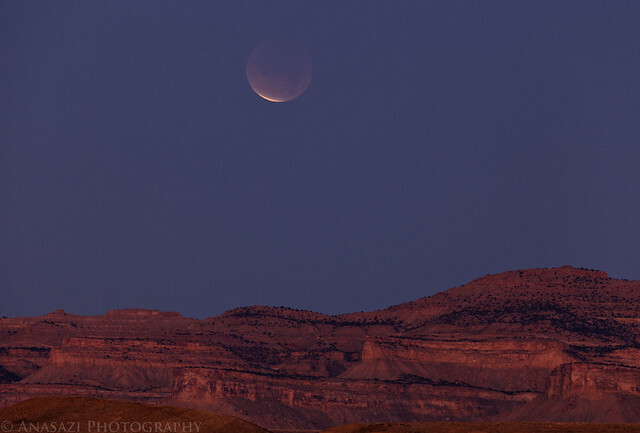 From the Yellow Cat area I was able to get this shot of the almost fully eclipsed moon over the Book Cliffs. I tried to get a photo when it was closer to the Book Cliffs, but the haze in the atmosphere made the moon pretty much completely disappear shortly after I took this photo. 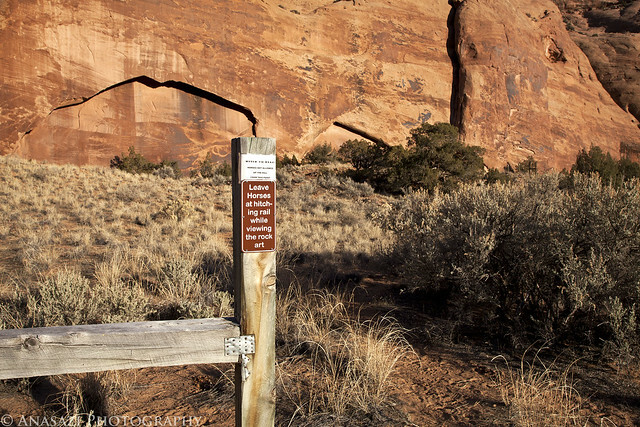 After packing up my tripod and warming my hands up in the Jeep I turned around to head back to the interstate and continue my drive to Moab. Just before the sun was up I took this photo of the two-track I was on as the sky turned pink. 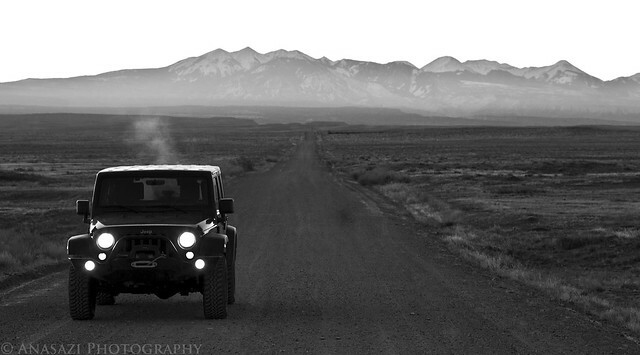 Driving back to I-70 on the Yellow Cat Road with the La Sal Mountains in the background. After meeting up with Marty, we drove over to the Sand Flats area in search of a few petroglyphs including another large snake that I had heard about. I had searched for this snake a few months back but had no success locating it. It turns out I was looking in the wrong location. 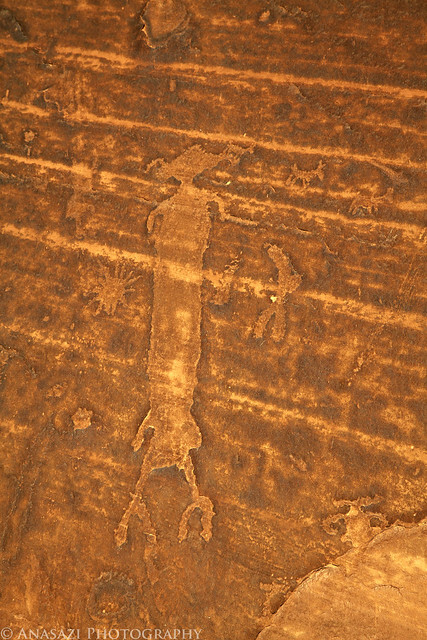 This snake petroglyph is at least as long as the Solstice Snake, but not as thick or as detailed. Still, it was a cool find. On our way back to the Jeep we ran into three women from Vail who asked us where the Mill Creek Canyon trail was. They had dropped off their car up in the Sand Flats area and taken a taxi back down to the trailhead that we had started from. They planned to hike up Mill Creek Canyon and Rill Creek Canyon to end up back at their car, but were on the wrong trail. Since Marty and I were planning on hiking up Mill Creek next, we gave them a ride to the right trailhead and started hiking up the canyon with them. Once we reached the confluence of the Left and Right Forks of Mill Creek we were stopped by a water crossing that was too high and too cold to cross. I was disappointed because I was hoping to visit a few new panels I knew about, but I guess I will have to return in warmer weather. The three women didn’t want to cross the cold water either, I offered to drive them back to their vehicle since they wouldn’t be able to complete their hike as planned. They took me up on the offer. 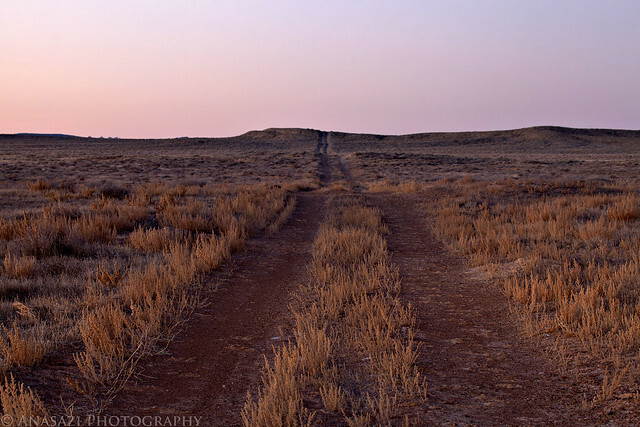 Once we explored the area a little bit and then hiked back out, I drove them back up to their car. After dropping the women off at their car, Marty and I headed back to another section of Mill Creek to do a little more exploring before the sun went down. 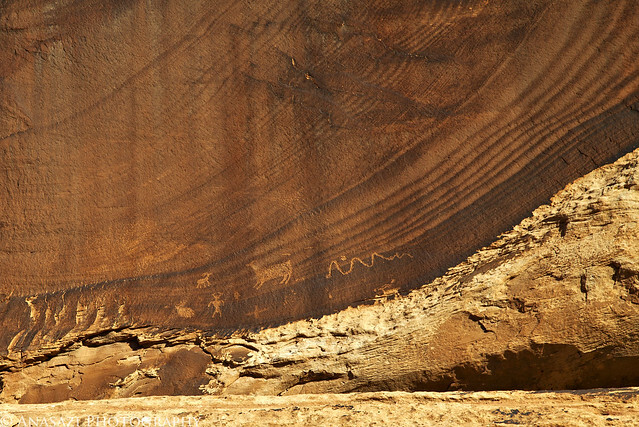 We didn’t have much time, but shortly after starting the hike we spotted an arc in the canyon wall that looked like a good place to find some rock art. As we got closer we found this sign and knew we were heading to the right place. 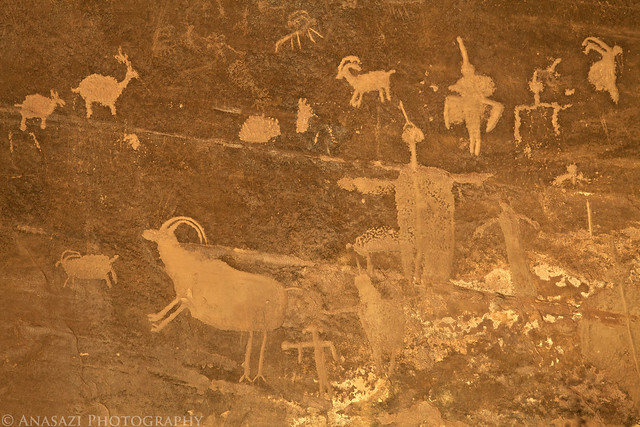 There were many old petroglyphs located here that were hard to see, but there was also a lot of modern graffiti. Since we made it here just before the sun was about to set, we had a nice orange glow off of the sandstone. 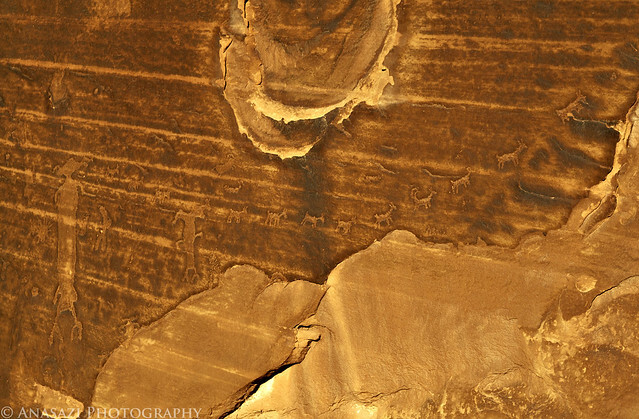 These petroglyphs reminded me of the Ascending Sheep Panel in the San Rafael Swell. A closer look at the anthropomorph and sunburst on the left. 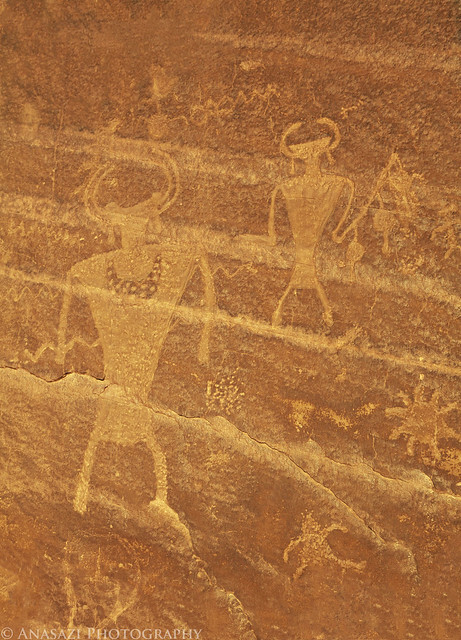 These two larger anthropomorphs remind of some that I have seen photos of from the Uncompahgre Plateau in Colorado. 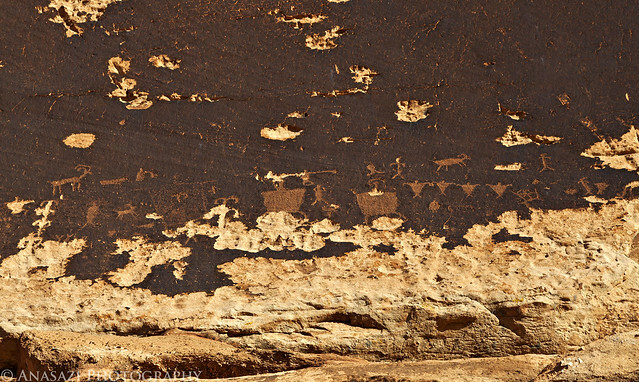 A few more petroglyphs found in this large panel near ground level. 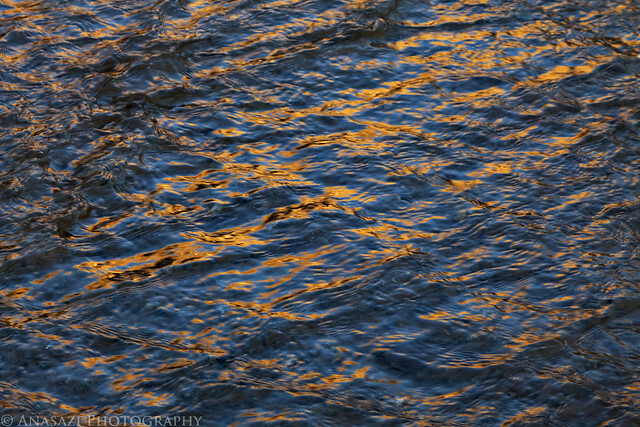 As we hiked back to the Jeep we had to cross Mill Creek again, and I noticed the orange light reflecting off of the water as it rushed by. Even though things didn’t go quite as planned, it was still a fun day and we got to see some new rock art and meet some new people.